The North Face Mossbud Insulated Reversible Jacket. 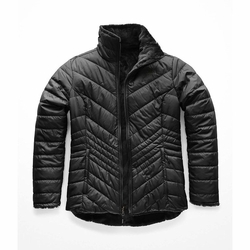 Get double the winter coverage with this reversible, insulated jacket featuring a wind-resistant and water-repellent exterior, and a silky, fur-like fleece interior. The updated quilt pattern breathes new life into one of our trusty classics.